What Are the Health Benefits of Sago? Sago is a starch taken from the center of sago palm stems. Sago has similarities to tapioca, including its look, taste and feel. However, sago is not tapioca, which comes from a different plant. 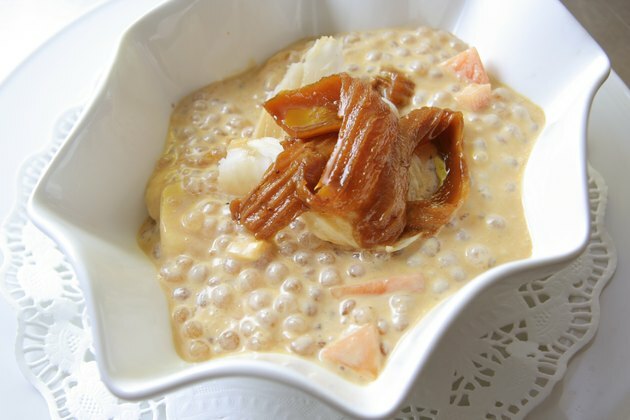 You can, however, substitute tapioca for sago in many recipes. Sago is a common ingredient used in Indian recipes. In gruel form, sago can function as a healthy alternative to carbonated drinks, providing energy without any artificial chemicals and sweeteners. Sago is used to make the pearls that sit at the bottom of bubble tea, a popular Asian drink. You can also use sago in the preparation of desserts and some breads. Additionally, you can add sago to rice for a low calorie, light meal option. In India, sago is also known as sabudana and has a long history in traditional Indian medicine. According to “The New Oxford Book of Food Plants,” traditional Indian medicine uses sago in combination with rice to cool the body. Therefore, sago can function as an herbal remedy to treat ailments resulting from too much heat, such as the production of excess bile. Sago is also used in traditional medicine outside the Indian subcontinent in Sri Lanka, New Guinea and other Asian Pacific countries. Recipes usually call for you to soak sago in water for long periods of time. After soaking the sago, you will find the starch less sticky and easier to handle than tapioca. You can also use the powder form of sago as a thickening agent for foods such as gravy or sauces. Additionally, you can use the powder form of sago as a flour substitute. In fact, recipes for many types of Indian and Nepali flat breads specifically call for powdered sago.